The SRLYN Sit-Stand Stool from Mey Chair Systems offers users working at height-adjustable workstations the option of an elevated seat or a leaning stance. The SRLYN helps to reduce strain on the muscles of the lower back and core, and on the legs and feet. 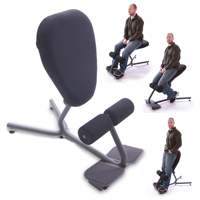 The leaning position also minimizes the effort required to return to a fully standing position and provides users with a greater range of motion and greater reach than does a standard seated position. Strong nylon glides engage the floor to ensure secure positioning of the seat. The incorporated rollers and handle enable users to move the seat easily between workstations. The unique design of the heavy-duty textured black tubular steel base maximizes stability while also greatly reducing the risk of tripping for passersby. This ruggedly designed seat has an industrial look but would also work well in an office setting. The Salli Twin is the model which introduced Salli's patented split saddle seat design. This seat is designed to correctly position the user in such a way that their back is moved into an optimum upright posture. Weight is transferred onto the sitting bones and off of soft tissue, reducing uncomfortable pressure points. The elevated seating position of the Salli Saddle naturally tilts the pelvis forward, moving the back into a corrected upright posture. The Salli Twin's design encourages an upright stance and open core which facilitates upper-body movement and can provide many of the benefits currently being attributed to Standing Workstations without the necessity of being on one's feet throughout the day. For cost-conscious users a more economical version of the Twin is now available. The Chin differs from the Twin only in that it has a lighter seat frame, standard (as compared to premium) components, a more limited warranty and fewer accessory and color options. Note: If the split saddle concept appeals but you are looking for a more active sitting experience the Salli Sway, Swing and SwingFit models may be of interest as each of these offer an 'active' tilt and free-moving seat design. Height adjustment of the gas spring lift is accomplished through a standard hand-controlled height adjustment lever. Available lift sizes and the corresponding heights they accommodate are as follows: Short (4'0" to 5'2"), Mid (5'1" to 6'1") and Tall (5'8" to 6'5"). The 5-point star base and lift are in an attractive chrome finish.The Salli Twin is only available by Special Order and can be purchased upholstered in either genuine leather or polyurethane faux leather, each available in a range of colours. 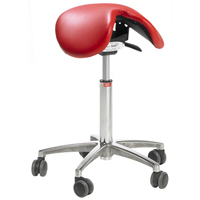 The Salli Classic is the most basic model of the Salli chair line, and provides the appropriate orthopedic support from the saddle seat design. The seat is a solid one-piece saddle design. A standard hand-controlled height adjustment lever for adjustment of the gas spring lift accommodates most adults. Available lift sizes and the corresponding heights they accommodate are as follows: Low (4'0" to 5'1"), Mid (5'2" to 5'11") and Tall (5'8" to 6'5"). The 5-star base and lift are available by default in an attractive chrome finish, black base and lift available by request.The total weight of the chair is 10.5 kg (23.1 lb), the seat is 7.5 kg (16.5 lb). The Salli Classic is only available by Special Order and can be purchased upholstered in either genuine leather or polyurethane faux leather, each available in a range of colours. The Salli Strong is a beefed-up version (for heavier individuals up to 330 lbs) of the the Salli Tilting Twin chair. There is a lever to provide adjustment allowing the split saddle seat to be adjusted on the front-back axis, and upon releasing the lever the chair will lock in that position. This makes it possible for the user to adjust the position of the seat to the optimal angle and make micro-adjustments over time as needed, and receive the appropriate orthopedic support from the split saddle seat design. The width of the two halves of the saddle seat is fixed and cannot adjust. A standard hand-controlled height adjustment lever for adjustment of the gas spring lift accommodates most adults. Available lift sizes and the corresponding heights they accommodate are as follows: Medium fits 5'1" to 6'1" (Seat height 22.5"-30") and Tall fits 5'8" and over (Seat height 25"-35"). The oversized (60 cm) 5-star base and lift are available by default in an attractive chrome finish. The total weight of the chair is 13 kg (28.6 lb), including the 9 kg (19.8 lb) seat, and is currently only stocked in a black leather. The FYLDST Folding Sit-Stand Stool from Mey Chair Systems offers users the opportunity to sit or lean while working. In addition to reducing the weight load and stress on the joints of the legs, this posture also lets users quickly move back to a fully standing position with minimal effort. Designed with portability in mind, at only 14.3 lbs the FYLDST enables users to easily move their chair with them between locations or job sites. 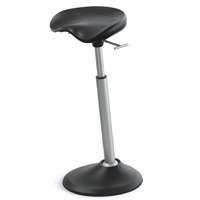 This stool offers an extended range of seat height adjustment from 21.25" to 35.4" which will accommodate virtually every user and is rated to support 264 lbs. Heavy rectangular tube steel construction, simple folding hinges, and handwheel adjustment of seat height mean this chair will last through years of heavy use. The Formed Polyurethane fixed seat angles slightly down at 10°, providing a comfortable resting place throughout the day. The textured surface of the seat facilitates airflow and makes the seat feel softer, improving comfort. The simple design of this model results in a rigid seating position, with the only cushioning being that of the reasonably firm formed-polyurethane seat. 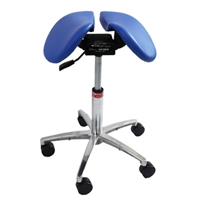 Users looking for more cushioning or not requiring portability may wish to consider one of the numerous other models from Mey Chair systems, with options of softer padding in the seats or gas spring cylinders for shock absorbance. 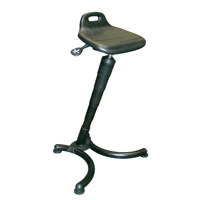 11044 Folding Sit-Stand Industrial Infinity Stool. The Salli Chin is a more economical model of the premium Salli Twin model, and provides all the orthopedic support and benefits that come from the patented split saddle seat design. The Chin differs in that it has a lighter seat frame, standard (as compared to premium) components, a more limited warranty and fewer accessory and color options. 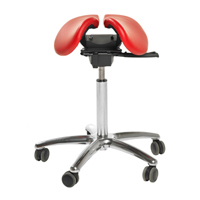 The split saddle seat design maintains the natural shape of the spine, strongly influencing the user to have good posture while sitting and working. The gap allows the tailbone to 'float', minimizing soft tissue pressures and spinal loads. The width of the two halves of the saddle seat are fixed and cannot adjust but the design accommodates most individuals body types. A standard hand-controlled height adjustment lever for adjustment of the gas spring lift accommodates most adults. Available lift sizes and the corresponding heights they accommodate are as follows: Short (4'0" to 5'2, Mid (5'1" to 6'1") and Tall (5'8" to 6'5"). The 5-point star base and lift are in an attractive chrome finish.The Salli Chin is is available in either Black Leather or Black Polyurethane (synthetic leather). The LOBAK Sit-Stand Stools from Mey Chair Systems are ideal as temporary perching seats. The short raised back encourages users to sit upright on the seat, adopting a posture that encourages correct spinal alignment. 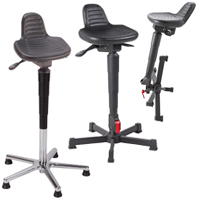 The tilt-adjustable seat also offers users the option of using the LOBAK as a leaning stool. The firm polyurethane foam seat is waterproof and highly resistant to cuts or punctures, with raised ridges to encourage air flow for a cooler surface. Height adjustment is accomplished with a gas spring that also serves as a shock absorber by providing a cushioning effect when the user sits down. The angle of the seat is adjustable from 3° to 17°, enabling the user to find the most comfortable position. The LOBAK Sit-Stand Stool is available in two models. Model 11002 features a locking clamp that secures the seat in an upright position but easily permits the base to fold up against the seat support for storage. Seat height on the 11002 ranges from 23.2" to 30.7" and is suitable for users of average height. 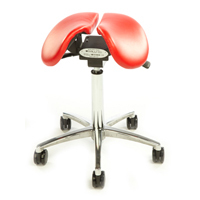 Model 11050 features the same seat on a chromed steel, fixed (non-folding) base. With a seat height range from 24.4" up to 34.6", this model is still suitable for most average height users but can also comfortably meet the requirements of taller users up to approximately 6'4". 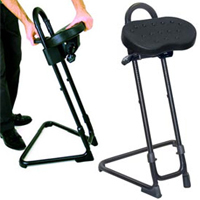 11002 Mey Chair Systems LOBAK Folding Sit-Stand Stool. 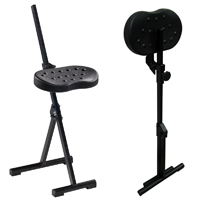 11050 Mey Chair Systems LOBAK Sit-Stand Stool.